Safety is critical when you are looking for a new vehicle — especially when you need a minivan for your family. You want a vehicle that you know you can depend on no matter what. The 2018 Chrysler Pacifica offers safety features that proactively help keep you and your family secure on the road. Here are five ways that the Pacifica protects your family. Minivans are big, which is a plus when transporting family and all the cargo that goes with it. Unfortunately, the size of these vehicles makes seeing in certain spots especially difficult. The 2018 Chrysler Pacifica has a 360-degree surround view camera, which is a system of four cameras that give you a bird’s eye view of what is around your vehicle. In addition to these cameras, the 2018 Chrysler Pacifica has a blind spot monitoring system that detects when a vehicle enters your blind spot. You will be alerted by a light in the corresponding mirror, so you do not have to worry about vehicles sneaking into your blind spot without you noticing. Full-Speed Forward Collision Warning-Plus: This system gives you audible and visual warnings when you are at risk of a collision. If you fail to break, the automatic brake system will stop the vehicle to avoid the collision when you are going over 25 miles per hour. Adaptive Cruise Control with Stop and Go: This system helps you maintain a set distance between your vehicle and the car in front of it. Once you pass the vehicle, the Pacifica will automatically return to its original speed. LaneSense Lane Departure Warning with Lane Keep Assist: This system guides you back into your lane if you unintentionally drift outside the lines. It will help you avoid driving into a ditch or another vehicle if you turn to look at your kids or are tired from driving. Parking a minivan can be tough. With the 2018 Pacifica’s available Parallel and Perpendicular Park Assist System, the vehicle controls your steering while you follow on-screen directions for the gear position, brake, and accelerator so you can get into especially difficult parking spots without stressing about hitting another vehicle. Other features that help with parking are the Rear Park Assist with Stop, which detects objects in your path and alerts you with visual and audible cues. This system can help you stop before a collision. Similarly, Rear Cross Path Detection monitors hard-to-see angles when you are backing out of tight spots, enabling you to confirm that no vehicles or pedestrians are in your path. For families, safety is the No. 1 priority in a vehicle. 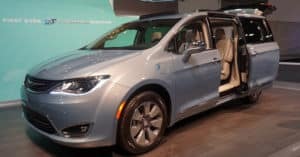 The 2018 Chrysler Pacifica offers that to drivers with its increased visibility, driving assistance features, and parking assistance technologies. To learn more about this minivan, visit Eastgate Chrysler Dodge Jeep Ram and book a test drive today.